I love this book so much! I can’t even put into words how much I love these characters and this story. Simon was hilarious and I love how he handled all the curveballs (understatement!!!) that got thrown his way. I think it’s such a refreshing and realistic young adult voice. The teenagers look, sound, and act like teenagers. The parents are actually present and accounted for, and they hold their kids accountable for their actions. I love that it’s set in Georgia and the author addresses that things are different for us (by us I mean not only non-heterosexual but also Black people) here in the south. I love that Abby is Black and it’s a big deal, but it’s also not a big deal. I love that these kids just do what they love and they don’t fall into these awful stereotypes and tropes. I was having mixed feelings about how I felt about how they handled the main conflict (i.e. what Martin did) but realistically, what can you do in that situation? My only complaint in this whole book was the exorbitant amount of pop culture references. Honestly, I couldn’t even get some of them and I live in this time period! This is such a great story, but I feel it’ll be too dated in just a few years. 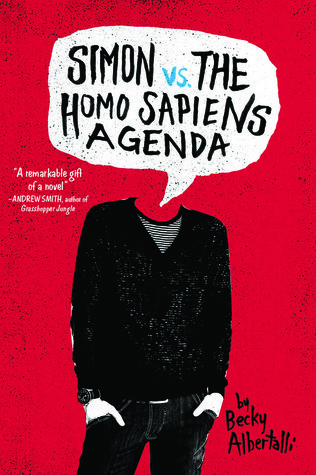 I totally get what you mean about the Martin thing, but overall Simon vs. the Homo Sapiens Agenda was probably my favorite YA contemporary read of 2015. Hmm, that’s such an interesting point about how this book will probably be dated in a few years. I hadn’t thought about that but you’re so right!